Gallia Academy junior Ben Cox (23) goes up for a shot attempt during the first half of a Jan. 5 boys basketball contest against Point Pleasant in Centenary, Ohio. CENTENARY, Ohio — Not a fairy tale ending. The Gallia Academy boys basketball team overcame a seven-point first quarter deficit and held a three-point lead midway through the fourth, but visiting Coal Grove made a 7-2 run down the stretch to pull off a 51-49 victory on Tuesday night in an Ohio Valley Conference matchup in Gallia County. The host Blue Devils (9-7, 6-4 OVC) built early leads of 2-0 and 6-4, but the Hornets (12-5, 7-3) countered with a 14-5 surge that gave CGHS an 18-11 cushion through eight minutes of play. The Blue and White rallied in the second frame as Justin McClelland scored five points during an 11-4 charge that knotted the game up at 22-all entering the break. 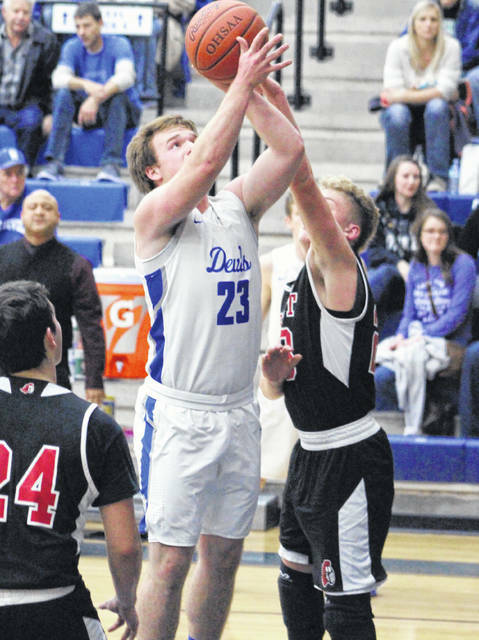 Aaron Music spearheaded a 16-11 third quarter run by Coal Grove that gave the Red and Black a 38-33 edge headed into the finale, but the Blue Devils answered with a 14-6 surge that ultimately gave the hosts their final lead of the night at 47-44. CGHS — which made only two field goals down the stretch — hit 9-of-11 free throws in the fourth while closing regulation with a 7-2 spurt that ultimately turned a one-possession deficit into a one-possession triumph. The Hornets also salvaged a season split after dropping a 65-58 decision back on Jan. 4 in Lawrence County. The Blue Devils outrebounded the guests by a 27-21 overall margin, including a 14-8 edge on the offensive glass. Both teams committed 13 turnovers apiece in the contest. GAHS netted 19-of-46 field goal attempts for 41 percent, including a 5-of-12 effort from behind the arc for 42 percent. The hosts were also 6-of-10 at the free throw line for 60 percent. McClelland and Cory Call paced Gallia Academy with 17 points apiece, followed by Blaine Carter and Bailey Walker with six markers each. Ben Cox completed the scoring with three points. McClelland led the hosts with six rebounds and three assists, while Cole Davis came up with a team-best two steals in the setback. The Hornets made 17-of-36 shot attempts for 47 percent, including a 5-of-12 effort from 3-point territory for 42 percent. The guests were also 12-of-17 at the charity stripe for 71 percent. Music and Cory Borders led Coal Grove with 15 points apiece, followed by Payten Smith with 10 points and Jaylen McKenzie with six markers. Nate Harmon and Evan Gannon completed the winning tally with three and two markers, respectively. Music led the guests with six rebounds, five steals and four assists. McKenzie also handed out four assists in the victory. Gallia Academy returns to action Saturday when it travels to South Point for an OVC matchup at 6 p.m.